Casita la Vegueta is a small house in the middle of La Vegueta, a village surrounded by the beautiful landscape of the Island of Lanzarote. The building is located directly on the main street. It is a good starting point for example for hiking-, walking- or cycling tours around the island. 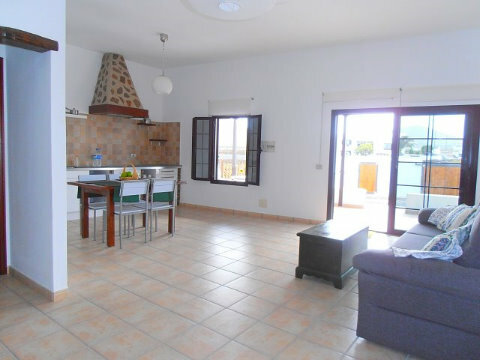 Casita la Vegueta is a brand new renovated and furnished holiday home. The center of the building consists in the large living room with dining area, as well as it´s open integrated kitchenette. The sofa located there can be transformed in a few steps to a large double bed, so that there could stay in a pinch 3 or even 4 people. Furthermore the house has one separate bedroom with a double bed and a bathroom with shower and toilet. There is also a small utility room with washing machine connected to the bathroom. The covered terrace is southwards faced and thus has sun during the whole day; this way it is also well protected from the mainly northerly winds. The car can be parked on the property.